We are planning a great cruising season for 2018! Looking forward to some great times on the water, and hoping that we can provide some interesting destinations and fun trips for all. The full schedule is below. Mark your calendars for our first cruise of the year! Our annual brunch and awards presentation at Oyster Point Yacht Club will be on Sunday January 21, starting at 10:30 am. Bring your boat or come by car, and enjoy a sumptuous brunch of eggs Benedict, bacon, ham, sausage, fresh fruit and pastries, breakfast potatoes, French toast, salad and antipasto. Following tradition, cruising awards will be handed out. This is always a great event, and we look forward to seeing you there! Plan to arrive at the dock around 10 am, as brunch starts at 10:30. We will have people on the dock to guide you to your slip and assist with mooring. Asphalt cruisers are of course highly encouraged!!! Join us as we explore the Aeolian Yacht Club, at the eastern end of the Oakland Estuary. Last year this was a particularly fun cruise, as the fleet traveled together and enjoyed opening the bridges on the way down the estuary. The hospitality of the Aeolian Yacht Club is wonderful, and a great time is guaranteed for all. Docking is free! Friday evening is Jam night at Aeolian, so bring your instruments and your voices!! Dinner Friday will be spaghetti and meatballs with a vegetarian option. Saturday evening in celebration of the Chinese New Year the current plan is to have catered Chinese food. Sunday morning Aeolian’s famous home cooked full breakfast will be awesome. $40.00 per person covers all three meals. If you have special dietary needs please let us know ahead of time and they will do their best to accommodate. Saturday morning Catherine Miskow will host a continental breakfast aboard either Cardinal Rule or Shannon. 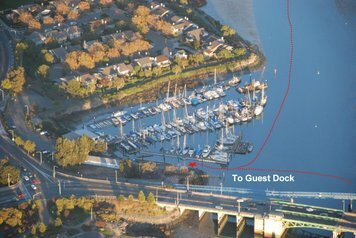 The Aeolian Yacht Club can be reached either: (1) from the West through the San Leandro Channel and under the Bay Farm Island Bridge. The Bay Farm Island Bridge operator is available for opening seven days a week from 8 am to 5 pm with the exception of Monday-Friday commute traffic; and (2) from the Oakland Estuary by way of three bridges, Park Street, Fernside (Miller Sweeney) and High Street. All three bridges may be opened any time 24 hours a day, seven days a week, with the exception of M-F commute times. All you need to do as you approach the first bridge is to call them on VHF Channel 9 to request a bridge opening for all three bridges. As you approach, each bridge is opened. It’s a snap! Aeolian Yacht Club monitors Channel 68 when there is a cruise in. PLEASE REGISTER NO LATER THAN FEBRUARY 9 !!! Join us Memorial Day weekend, Friday through Monday for a fun-filled time in Half Moon Bay. The Half Moon Bay Yacht Club will have dinner available all three nights. Lots of activities are planned for the weekend! Anchoring out or picking up a mooring ball is recommended for this cruise. 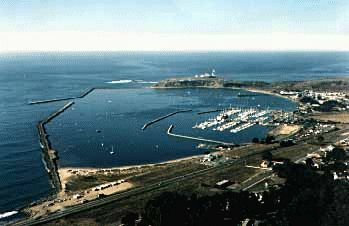 Half Moon Bay Yacht Club’s dinghy dock will be available. If you want a slip in Pillar Point Harbor please contact Bill Hoyt at 440-781-1997 and discuss with him. Guest slips at Pillar Point are first come first served, but we are working with the Harbormaster to try to secure berthage. At this time we cannot guarantee slips. An early arrival Friday will improve your chances. Join us on Father’s Day weekend for a fun filled family friendly foray to one of the Bay’s finest clubs! 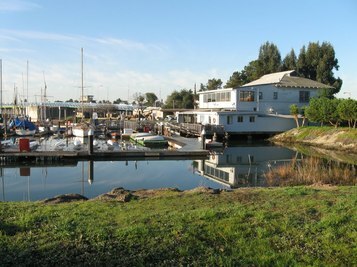 Encinal Yacht Club, being the 3rd oldest yacht club on the Bay, was founded in 1890. The club was established by residents living in Alameda’s Gold Coast, on the south shore of the Island. The club became famous for its moonlit parties, regattas, and cruising events. The club encouraged family participation from the very beginning. The first clubhouse was designed and built by Commodore Joseph A. Leonard, at the end of a 1,000 foot pier extending into the bay from the foot of Grand Street. The clubhouse was an elaborate Victorian design, the main floor was reserved for dancing and the second floor was the residence of the club manager. The San Francisco Chronicle declared the clubhouse to be the finest of its type on the entire Pacific Coast. In the 1950s the City of Alameda decided to develop the south shore of the island by filling in the waterfront. The members of the club fiercely opposed this scheme, holding out until fill was placed right next to the clubhouse. Ultimately the city prevailed, which meant losing the beloved clubhouse. For nearly four years, EYC was without a clubhouse and struggled to survive. For a time our meetings were held at Aeolian YC, and the membership even considered merging with Aeolian, except that EYC wanted a swimming pool and Aeolian did not. At the same time Marina Village was being developed on the Estuary, and a deal was struck to build the new clubhouse on the other side of the island. This was not without controversy, as many of the members wanted the clubhouse near their homes on the south shore. 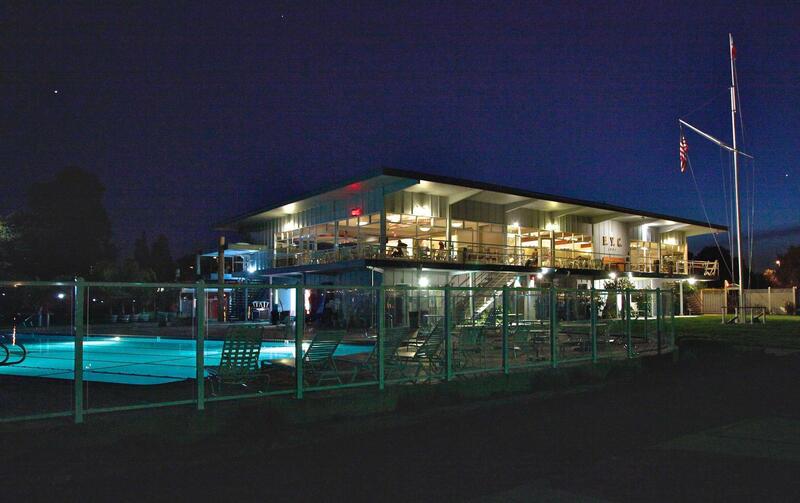 The new clubhouse was built in 1960, complete with a full-size swimming pool and guest dock facilities. We will be honoring Dads this weekend, so if you are a Dad, or are bringing a Dad with you, please let Cathy know! We hope for a warm weekend so we can enjoy the Pool. Meal options will be forthcoming. Berthing is $1.00 a foot a night.Berthing is rafting in the “Encinal Horseshoe”. Not all boats will have direct Dock access. Please remember when rafted to walk across the fore deck of neighboring boats, not through the cockpit. All boats must stern into the Horseshoe. Those against the back dock will need to wait till the raft breaks up to get out on Sunday. REGISTRATION CLOSES JUNE 8 ! ! ! Ballena Bay Yacht Club was founded in 1969 for boaters in picturesque Ballena Isle Marina. Today they are an all-volunteer, not-for-profit organization with approximately 180 members, the only yacht club on the western side of Alameda, California. The clubhouse is right on the water at the C Dock of Ballena Isle Marina. 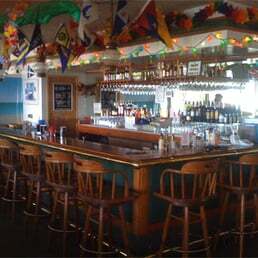 The full bar (with TV, comfortable seating area, fireplace, wi-fi access, ice machine, darts and dance floor) opens to the east while the dining room faces west and enjoys sunset water views of the USS Hornet and the San Francisco skyline. 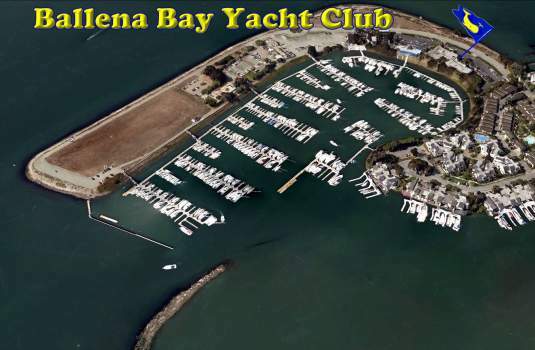 IMPORTANT: Ballena Isle Marina is separate from Ballena Bay Yacht Club. Each skipper is responsible for registering with Ballena Isle Marina and providing insurance infomation to them. Please complete the form below and send it along with your insurance document to the Marina prior to the cruise or bring it with you when you arrive. You must also pay your dock fees directly to the Marina. REGISTRATION CLOSES JULY 9 ! ! ! 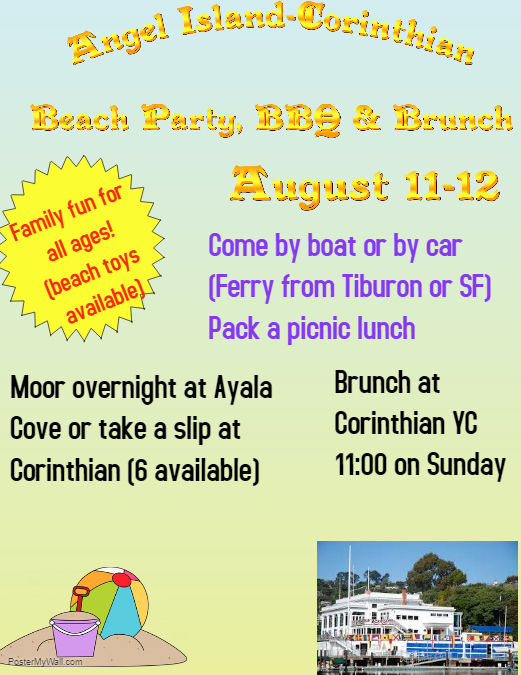 Join us for a Coyote Point Yacht Club Potluck Barbecue on Angel Island. Come by boat or come by car to Tiburon and take the Ferry to beautiful Angel Island. The festivities begin Saturday afternoon with fun on the beach at Ayala Cove. Bring your Frisbees, kayaks, footballs, toys of all types. We will fire up the barbecues around 2pm. Bring whatever you want to cook on the grill, and a side dish or dessert to share. After the barbecue, we have the guest dock at Corinthian Yacht Club right across Raccoon Strait available for those boaters who wish to tie up at a dock overnight. We have only six spots at the dock, so sign up early!!! For those who desire the tranquility of an evening on the moorings at Ayala Cove be sure to arrive early in the day to grab a spot. Ayala Cove moorings are fore and aft, and two boats may raft together on one set of moorings. Overnight mooring at Ayala Cove is $30.00. Day use of the dock is $15.00. The legendary Sunday Morning Brunch at Corinthian Yacht Club caps off this fantastic weekend. The cost for brunch is $38. Space is limited; please sign up early. Brunch begins at 11am. This is a high class affair, so dress appropriately! Afterwards the fleet can sail together back to Coyote Point on Sunday afternoon. Sign ups for docking at Corinthian YC are now closed. There is plenty of room for the BBQ at Angel Island, and we still have a few seats at Corinthian Yacht Club’s brunch Sunday morning. Please contact Mark Bettis at 650-773-8363 or mbettis5@sbcglobal.net with any questions! On-line sign ups are closed. Docking at Corinthian is full. There is still room at Angel Island and at Corinthian YC Brunch Sunday. Please call Mark Bettis at 650-773-8363 if you want to come! Plans are well underway for our annual Labor Day Weekend Cruise to Marin Yacht Club in San Rafael. Join us for three days of fun at this beautiful Club nestled along the San Rafael Channel. This Club offers a swimming pool, tennis courts as well as a Bocce Ball court. This is a very “kid” and dog friendly destination. Dogs must be kept on a leash. Splash your dink and wind your way to several great entertainment destinations up the Channel toward downtown San Rafael. For those that are making the trip on Friday, the Club offers dinner in their dining room, cook aboard or uber to town. We are returning to the group BBQ on Saturday Night. This is a do it yourself bbq and each boat is asked to bring a side dish ( enough for 6-8 people ) to share. Dining takes place at a long farm table with views onto the channel and the Bay. The weekend is capped off with Sunday Night dinner at the Club, usually a buffet. New this year will be a cocktail party before Saturday’s BBQ dinner upstairs at the Club Bar. Our Commodore,Yvette, will provide lite hors d’oeuvres at the no-host bar. We are hoping to be able to provide some music during this Cocktail Hour before making our way downstairs to the BBQ. The Bar will be open through dinner for our pleasure. Sunday Afternoon there will be a Bocce Ball tournament with awards presented at the Sunday Dinner. Everyone is encouraged to enter the tournament, (form a team of 2) and instruction will provided prior to the start of the Tournament. This is a great spectator event should you not be interested in playing. Bring a chair, a cooler and support your favorite team. As always when Cruising, everyone is strongly encouraged to support the host Club by partaking of the meals that they offer, in this case, Sunday Night is the one not to miss. Please keep this in mind when signing up for this years Cruise. Tide notes and additional Cruise information will be provided as we get closer to Labor Day. Get it on your calendar and watch for Cruise sign up information. Detailed course information will be available for the first timers. Everyone has a slip or endtie at Marin, so don’t worry about having to raft. The docks are beautiful and there is ample and stable power. REGISTRATION CLOSES AUGUST 19 ! ! ! Join us for the opportunity to take local veterans out for a couple hours of boating on the Oakland Estuary or in the Bay. 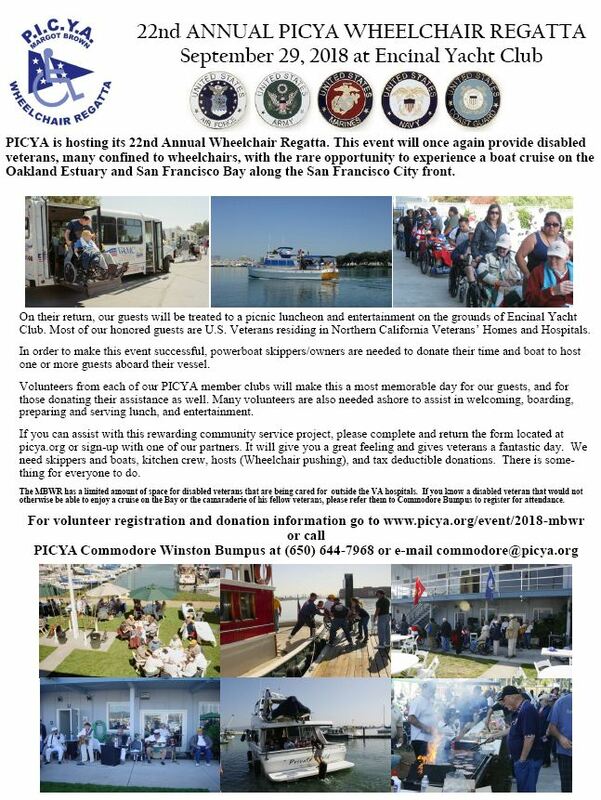 For those donating their time and boats for this event, it starts on Friday night with a skippers meeting and dinner at the Encinal Yacht Club. You can stay at Encinal overnight on Friday night so that you are there for the Saturday event, or you can arrive at the event with your boat on Saturday morning. The vets usually start showing up about 9:00 AM on Saturday and the local coastguard, fire department, and law enforcement volunteers start loading boats. As part of the registration process, you will let the organizers know how many wheel chairs you can accommodate on deck and how many people overall that you can take. (On the PandaAngler I usually request two wheelchairs and four ambulatory, which with myself and one crew member makes for a full boat). The wheelchair-bound vets usually arrive with assistants to help along the way. Follow the instructions below to sign up, and please notify Gary when you do. Join us for our cruise to Napa Valley Yacht Club, October 26-28, 2018. 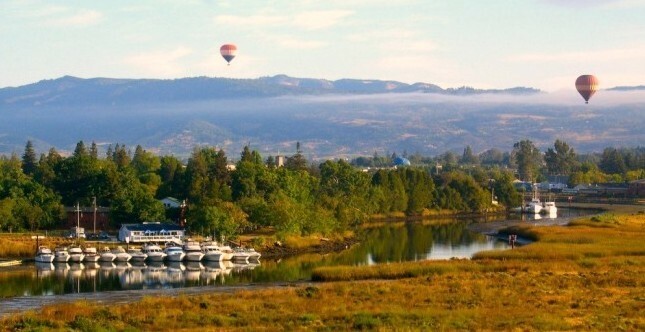 The unassuming Napa Valley Yacht Club is located at the end of the Napa River, near the Imola St. bridge, just minutes from downtown Napa, where tasting rooms, small wineries, and restaurants abound. A short ride up the valley gets you to either the Silverado Trail or Highway 29, with its myriad of well-known (and not so well known) wineries. Never been to Napa? See Cathy for recommendations on restaurants and wineries. Friday night will feature dinner at the yacht club, and their annual Halloween Costume Party. Come in costume—prizes for the best CPYC cruisers will be awarded! 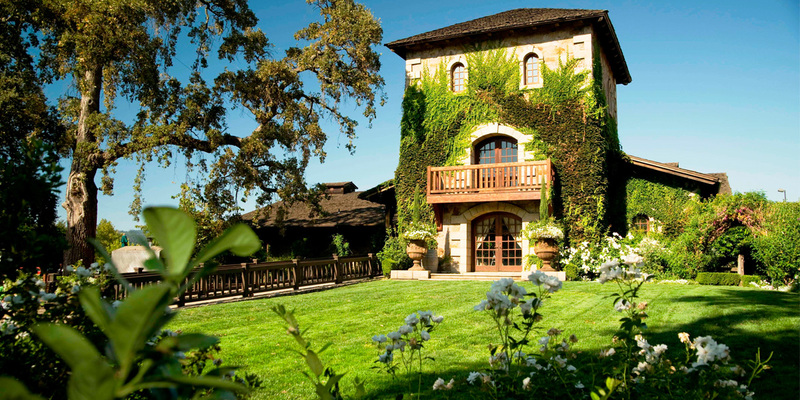 On Saturday, a wine tasting excursion will be arranged to either V. Sattui, Cosentino, or Mondavi wineries (advance reservation required for parties of more than 8). RSVP is required for the tours/tastings, and the winery chosen will depend on the number of guests. Saturday night dinner will be on your own, or in town. The Napa River has been dredged to 9 feet at mean low water. Clearance under the Imola Avenue Bridge at high tide is 60 feet. Sailboaters with tall masts wishing to participate in the cruise-out can receive berthing at the Napa Valley Marina for the same rate as the yacht club guest dock. Docking is $45 per night, regardless of boat length.